Gifts & souvenirs are the most sought after items in the island. After all having visited Langkawi, you will like to take back some gifts for your dear ones and some souvenirs to take back the memories. No wonder there are hundreds of shops that have mushroomed in the island selling all kinds of gifts & souvenir items. Walk along the streets of Pantai Cenang or Kuah, every other shop would be a Gift & Souvenir shop or at least have a section dedicated to that. So the next question is what kind of items are you looking for? If you are a serious buyer looking for some authentic art & craft ware, crystal & glasswork, then there are some places in the island that will blow your mind away. But you will need some money in your pocket or else you will only keep watching such handcrafted wonders. If this is what you are looking for then one such great area to visit is Craft Complex, a large craft house near the northern shoreline of the island showcasing intricate artwork & designs by local and reputed artists & artisans. You will get forest based products, exquisite silver & brass ware, paper based products, wood & bamboo carvings, clothes & apparel, batik prints and even Sogkets that are made of gold & silver threads being interwoven into a textile. Right next to the Craft Complex is another gem of an artwork studio, Faizy Crystal which is a glass blowing studio making exquisite glass items like figures of birds, animals, flowers, then flower vases, plates and lot more. You can see the artists making the pieces right in front of you. Another such similar place is Langkawi Crystal in Kuah town. If you take interest in authentic Batik art & prints, visit Atma Alam Batik Art Village, a place where resident artists and the owners themselves create amazing batik prints. Don't forget to pick up a batik art on silk. 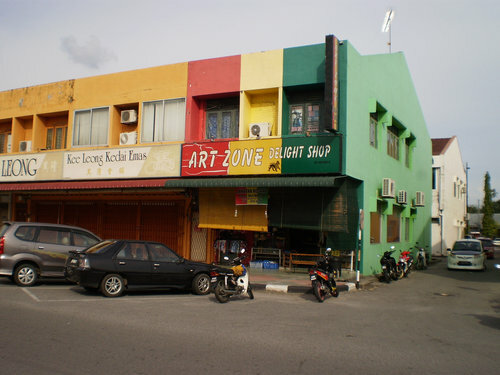 This store is located in Kuah town. Here you can buy lots of cheap souvenirs and art. There are wide range of items here, mostly very cheap including key rings of different types, perfumed pen stands, handcrafted pencils, caps & hats, belts, bags, sandals, banners, printed cloth pieces and lot more. A simple key ring could be as cheap as RM1. Located in Burau Bay in Pantai Kok area where the Cable Car ride takes place, Oriental Village is a great place to hunt for casual gift & souvenir items. There are lot many shops here that are dedicated only for souvenir & gift items and they are all moderately priced. The hottest selling products are the T-Shirts & souvenirs. Check out Shopping at Oriental Village for full information. This is a very popular store with the tourists looking for Langkawi imprinted T-shirts, dress materials for men & women, some nice batik printed clothes etc. They are all very reasonably priced. The staffs here are quite friendly as well and they won't get tired showing you the stock. You can also do a bit of bargaining here. The store is located in Kuah. This is a large chain and a branch is located in Pantai Tengah near the Holiday Villa Resort. They offer various handcrafted souvenir items made of Wood, Bamboo, Marble, Leather, Ceramics etc. They also keep silver jewelry, summer wears, batik prints etc. Lot.589, Kampung Simpang Tiga, Pantai Tengah, Langkawi. There are a myriad of souvenir stores along both sides of the street in Pantai Cenang selling all kinds of items. Check out Pantai Cenang Shopping where I have discussed several of them and their offerings.